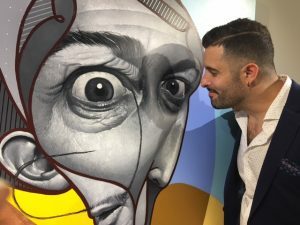 We meet with Miguel Ángel Belinchón Bujes, better known as Belin, an Andalusian artist internationally recognized for his hyperrealistic spray technique. 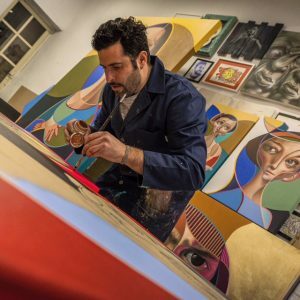 Born in Linares (Jaén), he leads with his talent a new style, one that he defines as “Post Neo Cubism”. Belin highlights the internationalization as one of the main keys for his artistic development. In fact, he is currently in Colombia participating in the event “Ciudad Hippa”, a project focused on hip hop and graffiti in Medellin. And also, last June, 24 Beaubourg Gallery, located next to the Pompidou in Paris, dedicated an exhibition to his work. 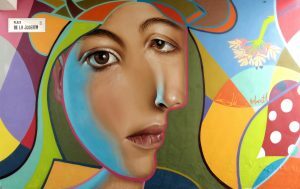 Belin’s creations have been displayed in museums, art galleries and street walls of many cities in Spain and almost all over the world. – Málaga (Spain) has been the starting point for your series of portraits inspired by Picasso and the cubism. This series were presented at your first solo show under the term “Post Neo Cubism”. What is really “Post Neo Cubism”? “Post Neo Cubism” is the result of my whole experience as a painter, where I mixed the realism that I have been working on for many years, the lines that I have used since my first graffiti and the cubism that I explored in depth when I worked with a mural painting in Málaga last year making a portrait of my daughter Natalia inspired by a Picasso painting. Mural painting located in la Plaza de la Judería, Málaga. – Besides Picasso, were there other artists or schools that have inspired you in your career path? 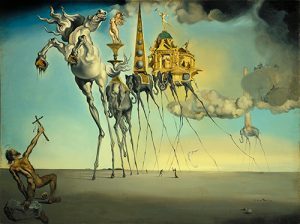 All of the artists that I have met have been an inspiration, but there is someone who really evoked in me such a big fear and love for the art, Salvador Dalí. I remember, back when I was in elementary school, I could not stop looking at the picture of his painting “The Temptation of Saint Anthony” in one of my books. It was hypnotic. The Temptation of Saint Anthony, 1946. Salvador Dalí. But there are many more that are truly an inspiration, from the classic artists such as Van Gogh, Velázquez or Murillo to the contemporary ones like Keith Haring, Basquiat or DAIM. 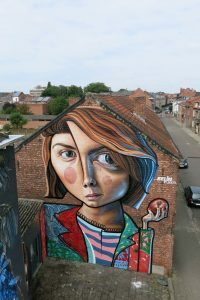 – To create your distinctive faces, instead of brush, you use spray and in many cases your medium is the street. Do you consider yourself an urban portraitist? I consider myself an urban portraitist. Color came to my life with my street paintings. The street gave me space lighting. I learned there how to use uneven walls. Although, I have to say that I am currently painting a lot with brush for my artstudio. – Why do you have that need of painting faces? I need to show things with expressions. Every look sends a message. I need to believe what I paint. I want my portraits to communicate with you. – Why do you enjoy so much working on the street? 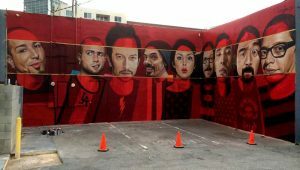 What is the reason behind the big success street art is having? I like working on the street mainly because of the freedom of spaces but also because I know that in the street you get a great dissemination of your work. 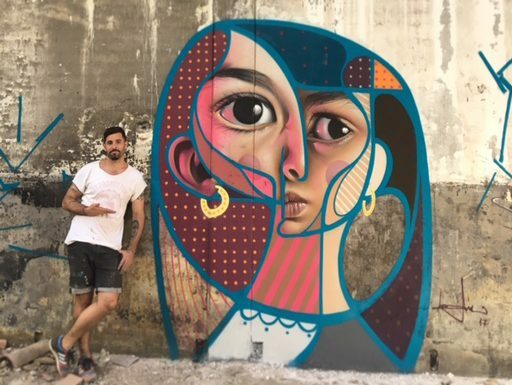 Over the last years, the social success of our street art and graffiti work has improved the perception of urban art and thanks to that it is now considered as an ART form. Fashion designers or even important museums are becoming interested in our work. 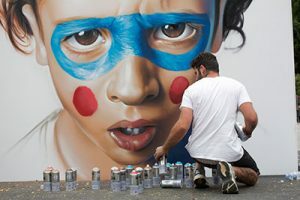 – Do you think street artists are becoming brands? Could this mean for artists a new way of funding? Indeed, I think so and I also think it is normal. Dalí or Picasso are brands, same as Banksy and Obey. – A lot of experts see you as an artist that masters the hyperrealism without using tools (stencils, projectors) to help your work. Have you created your own process of work? Why do you feel so attracted to hyperrealism as an artistic language? I don’t like using external tools other than my brushes or my sprays to ease the process of my creation because I want to give all my energy to every piece and if I used stencils or projectors I would be reducing part of my mark and the end result would not be a Belin anymore. Hyperrealism is how I know to express myself. As a previously said, I need to believe what I paint. – In addition to France, you have showcased your work in Mexico, Germany, Israel or Brazil. You are a real globetrotter of art. Do you think it is important the internationalization of artists? The internationalization of artists is essential, since we must be universal. Everybody must know our work, I think that is something that every citizen of this planet deserves, knowledge. – Recently, at the acclaimed exhibition of Ramón Casas in CaixaForum Madrid, we enjoyed with the posters that the Catalan artist created for Codorniú. Other companies such as Dockers or Sephora used your work to promote their brands. 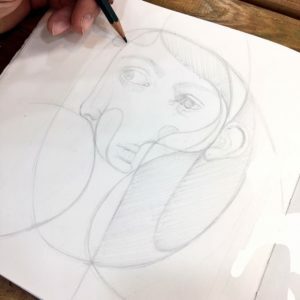 How do you analyze this connection between art and commercial brands? Well, this way of working with brands is part of the road of an artist evolution. Personally, I don’t think it is very important from the artistic point of view, but it is from an economic one. And we need the latter in order to grow. – Philanthropy seems to be very present in your life thanks to your participation in several solidarity events. Can art change the world? Should artists get more involved in social causes? Art has always changed the world and it must keep doing it, we have a universal language that everyone can understand. As artists, we usually have a very high sensitivity. Any problem can really affect us so I think it is easier for us to use our art to denounce all kind of injustices, no matter of their nature. Work by Belin for the campaign “Día SOMOS 2014”. 33 NGO’S fighting against social injustice. – In our platform there are a lot of Andalusian artists. How do you see the current landscape of contemporary art in Andalusia? Andalusia is a land of art. Just in my city, Linares, we have plenty of art to export worldwide. The art of our land blossoms like poppies in spring. Andalusia is like that because of its original mixture of cultures, we have the talent in our genes. – Finally, we would like to ask you to choose one artwork made by the artists of our platform and the reason you picked it. I choose “Hecatombe animal” by Miguel Scheroff. 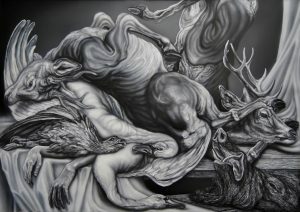 Hecatombe animal, 2014. Miguel Scheroff. The first reason I have chosen this wonderful artwork is simply because I love it. But then I also know the author and I know he is a great artist, very humble and with a talent that makes him special and unique.